Your radiator is one of the most essential components in your vehicle. While you don’t need the radiator to run your engine, your engine won’t run for long without a functioning radiator. Why? Well, engines heat up. As the engine turns, the pistons fire and mini-explosions cause heat. Moreover, components throughout the engine rub against one another, and heat caused by friction is transferred into an engine’s oil and parts. When the heat starts rising, it’s necessary to have a cooling system to keep components from bending, cracking, or melting. After all, an overheated engine can suffer irreparable damage. How does my radiator work? Your car’s cooling system is actually rather simple. It’s comprised of a fan, the actual radiator itself, and a series of hoses that cool the engine and transmission. The magic starts at the radiator. As your vehicle rolls over the road, the radiator pulls in cool air with the help of the vehicle’s momentum. Fresh air rolls over tiny “fins” which quickly cools radiator fluid (or coolant) that’s traveling through tubes that are in direct contact with the metal fins. The cooled radiator fluid is then pumped throughout parts of the engine block and transmission, where it captures heat from the engine. The heated coolant then returns to the radiator, and voila, it becomes cool again. Radiators also have temperature gauges which display your engine temperature on your dashboard. In addition, radiators have an overflow compartment which relieves changing pressures in the radiator. How can I tell my radiator is failing? If you have an engine that’s overheating, or your temperature gauge is redlining, then you may have a radiator problem. In addition, radiators can crack and leak, and radiator hoses may fail. If you don’t notice rising temperatures first, you may notice a strange smell and steam pouring out of the hood. Stop your vehicle and turn off the engine immediately if you do notice overheating or steam. You may also notice coolant leaking onto the ground if you have a slow leak. Regardless of the issue, it’s usually a quick assessment to locate the source of the issue. Coolant should be replaced regularly and fluid levels should be maintained. Radiator fluid can break down over time, and it can become contaminated with particles from the engine—and that can cause damage. 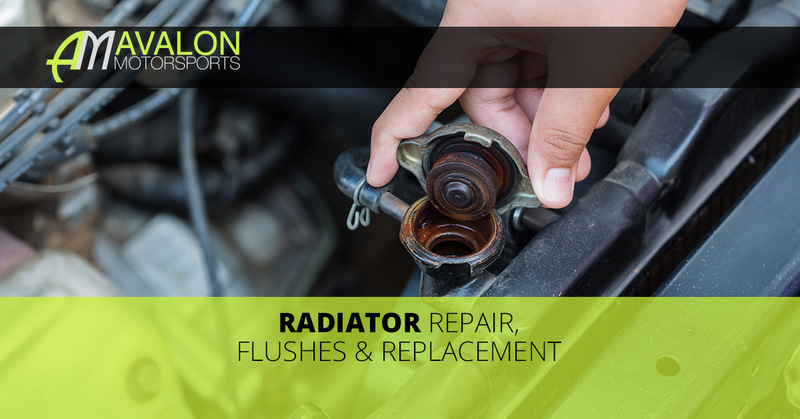 A radiator flush replaces the coolant throughout your radiator system, which means cooler temps for your engine, and less of a likelihood of damage. How often do I need a radiator flush? Most vehicle manufacturers recommend a radiator flush every 30,000 miles, or every three to five years. However, it’s best to consult your owner’s manual for your specific make and model. A radiator flush is relatively inexpensive, only a hundred dollars or so, and it is well worth the dough to keep your engine cool and operational. Ready for a Radiator Service? When things are too hot under the hood, you can count on your German auto repair experts here at Avalon Motorsports—we’re conveniently located right here in Denver. We provide a full suite of radiator services, including radiator flushes, cooling system repairs, and complete radiator replacement, among other repair services. We work on Audi®, BMW®, Volkswagen®, Porsche®, and Mini® vehicles. If you’re curious about your vehicle’s radiator, or ready to bring your wheels in for service, then give us a call!